The fight between branches of government continues over evidence on whether early Trump administration appointees at the State Department retaliated against career employees with whom they had political differences. On March 15, House Foreign Affairs Committee Chairman Rep. Eliot Engel, D-N.Y., joined with Sen. Robert Menendez, D-N.J., ranking member of the Senate Foreign Relations Committee, in a letter to Secretary of State Mike Pompeo denouncing “efforts to obstruct investigations” going back well into 2018. They demanded an array of documents. Last month, the controversy drew in inspectors general for the State and Homeland Security departments, who had complained to Congress about being stiffed in interview requests while probing the allegations. Asked for comment, a State Department spokesperson confirmed receipt of the letter and said the department plans to “respond accordingly.” The matter, said the emailed statement to Government Executive, “has been referred to two independent entities for review,” namely State’s IG and the U.S. Office of Special Counsel. “The State Department takes these allegations as well as requests by members of Congress seriously,” the spokesperson said. 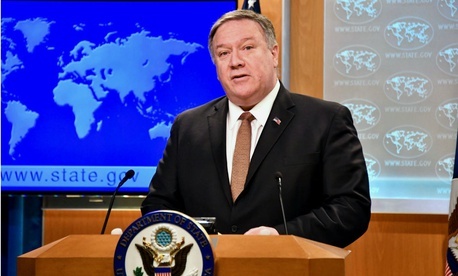 “Secretary Pompeo has shown his full support for career staff at the State Department and at the Central Intelligence Agency. Political retribution will not be tolerated. We always work closely and cooperatively with Congress and seek to be as timely and responsive as possible to their requests for information.” No further comment can be provided, the statement added. The letter linked the requests to a list of Trump appointees, among them State Department Senior Adviser Mari Stull, Christine Ciccone, Makan Delrahim, Sean Doocey, Julia Haller, Brian Hook, Edward Lacey, Matthew Mowers, Margaret Peterlin, Andrew Veprek, John Zadrozny and Kevin Moley. They also sought documents addressing proposed or actual personnel actions taken during the Trump administration against policy planning staff member Sahar Nowrouzzadeh, the subject of the Politico article. Ciccone, who has moved to a position at Homeland Security, became the subject of IG complaints last month accusing her of rejecting their requests for interviews. She told Government Executive on Wednesday that she has since done the requested interview, having delayed it, she said last month, until she could review materials from her tenure at State.